San Francisco Chronicle, 29 January 1899. Image included with article header. Note: This article was updated on February 19, 2016 to include the following transcription of the article. The digital scan of the article itself has been typed in full, including all spellings precisely as in the article. (e.g. “inclosed” when currently “enclosed” is considered the proper spelling, and the era’s stylistic choice of not capitalizing street when part of a street’s name nor county in the same manner) This transcription is to aid in the ease of reading this tale with ease. The images of the original article from the San Francisco Chronicle, 29 January 1899 follow the transcription. 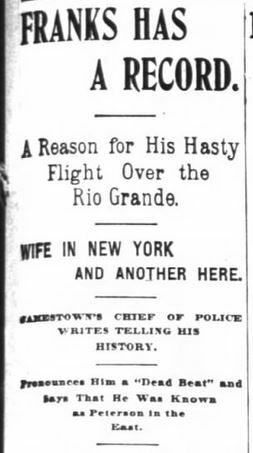 A Reason for His Hasty Flight Over the Rio Grande. WIFE IN NEW YORK AND ANOTHER HERE. Jamestown’s Chief of Police Writes Telling His History. Pronounces Him a “Dead Beat” and Says That He Was Known as Peterson in the East. 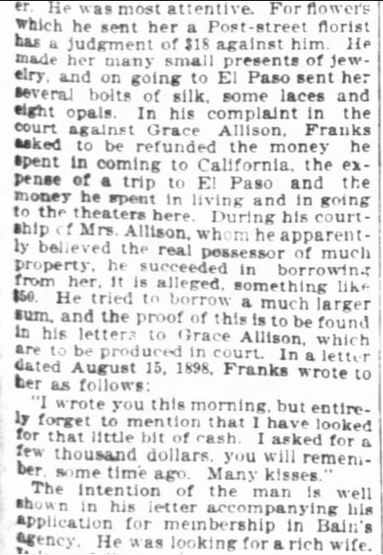 A good deal of sympathy seems to have been wasted upon Henry C. Franks, the missing witness against Isaac W Bain and Grace Allison, charged in the Federal courts with using the mails to defraud patrons of their matrimonial agency. 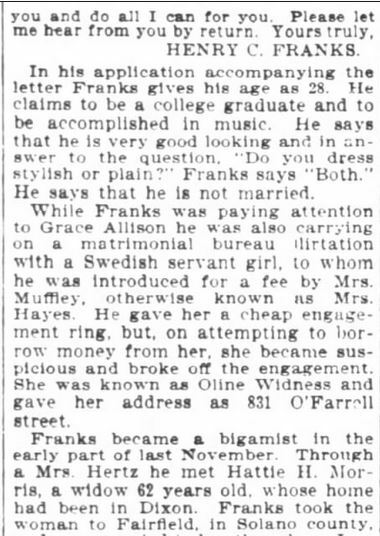 Franks has been described in the papers as a gullible Eastern youth who came out to San Francisco to meet Grace Allison and to marry her. She posed as a widow with $35,000 and to win her Franks has testified in the various hearings of the case that he was induced to spend a thousand dollars in presents and in the expenses of his trip out here. 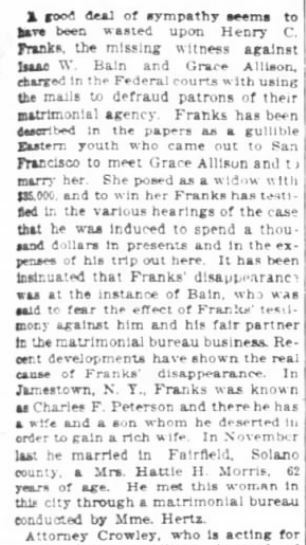 It has been insinuated that Franks’ disappearance was at the instance of Bain, who was said to fear the effect of Franks’ testimony against him and his fair partner in the matrimonial bureau business. Recent developments have shown the real cause of Franks’ disappearance. In Jamestown, N.Y., Franks was known as Charles F. Peterson and there he has a wife and a son whom he deserted in order to gain a rich wife. In November last he married in Fairfield, Solano county, a Mrs. Hattie H. Morris, 62 years of age. He met his woman in this city through a matrimonial bureau conducted by Mme. Hertz. T.J. Crowley, San Francisco, Cal. –Dear Sir: Your letter, with photograph, inclosed at hand. The latter is a good picture of Charles F. Peterson. He left here a year ago last summer, leaving behind a wife and son and several creditors as well. He is a contractor and builder. His wife is living at 118 Crescent street. I think you can get further information by writing to Brandford, Pa., where I understand there is a warrant for him growing out of his shady business transactions. He is what I should consider a genuine dead beat. Respectfully, FRANK A. JOHNSON, Chief of Police. 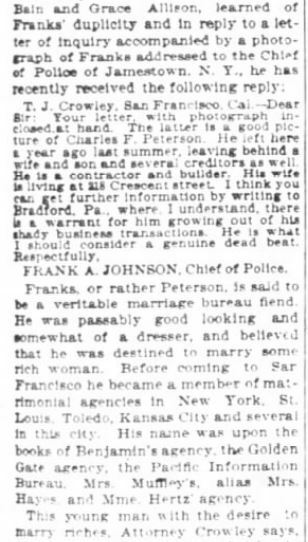 Franks, or rather Peterson, is said to be a veritable marriage bureau fiend. He was passably good looking and somewhat of a dresser, and believed that he was destined to marry some rich woman. Before coming to San Francisco he became a member of matrimonial agencies in New York, St. Louis, Toledo, Kansas City, and several in this city. His name was upon the books of Benjamin’s agency, the Golden Gate agency, the Pacific Information Bureau, Mrs. Muffley’s, alias Mrs. Hayes and Mme Hertz agency. This young man with the desire to marry riches, Attorney Crowley says, was not induced to come to California by Grace Allison’s glowing love letters, as he alleged on the witness stand. 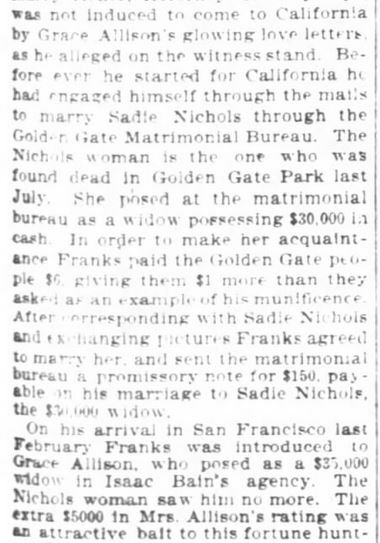 Before ever he started for California he had engaged himself through the mails to marry Sadie Nichols through the Golden Gate Matrimonial Bureau. The Nichols woman is the one who was found dead in Golden Gate Park last July. She posed at the matrimonial bureau as a widow possessing $30,000 in cash. In order to make her acquaintance Franks paid the Golden Gate people $6, giving them $1 more than they asked as an example of his munificence. After corresponding with Sadie Nichols and exchanging pictures Franks agreed to marry her and sent to the matrimonial bureau a promissory note for $150, payable on his marriage to Sadie Nichols, the $30,000 widow. The intention of the man is well shown in his letter accompanying his application for membership in Bain’s agency. He was looking for a rich wife. 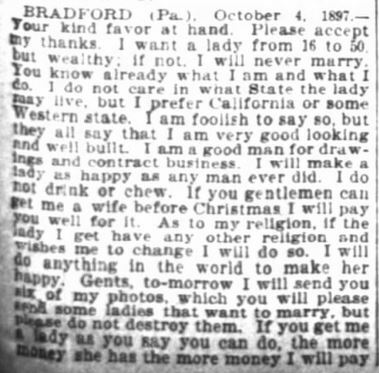 BRADFORD (Pa.), October 4, 1897—Your kind favor at hand. Please accept my thanks. I want a lady from 16 to 50, but wealthy, if not, I will never marry. You know already what I am and what I do. I do not care in which State the lady may live, but I prefer California or some Western state. I am foolish to say so, but they all say that I am very good looking and well built. I am a good man for drawings and contract business. I will make a lady as happy as any man ever did. I do not drink or chew. If you gentlemen can get me a wife before Christmas I will pay you well for it. As to my religion, if the lady I get have any other religion and wishes me to change I will do so. I will do anything in the world to make her happy. Gents, to-morrow I will send you six of my photos, which you will please send some ladies that want to marry, but please do not destroy them. If you get me a lady as you say you can do, the more money she has the more money I will pay you and do all I can for you. Please let me hear from you by return. Yours truly, HENRY C. FRANKS. In his application accompanying the letter Franks gives his age as 28. He claims to be a c ollege graduate and to be accomplished in music. He says that he is very good looking and in answer to the question, “Do you dress stylish or plain?” Franks says “Both.” He says that is not married. While Franks was paying attention to Grace Allison he was also carrying on a matrimonial bureau flirtation with a Swedish servant girl, to whom he was introduced for a fee by Mrs. Muffley, otherwise known as Mrs. Hayes. He gave her a cheap engagement ring, but, on attempting to borrow money from her, she became suspicious and broke off the engagement. She was known as Oline Widness and gave her address as 831 O’Farrell street. Franks became a bigamist in the early part of last November. Through a Mrs. Hertz he met Hattie H. Morris, a widow 62 years old, whose home had been in Dixon. Franks took the woman to Fairfield, in Solano county, and was married to her there by a Justice of the Peace. Franks was after her property, which he learned consisted in the main of lots in Oakland and in San Francisco. 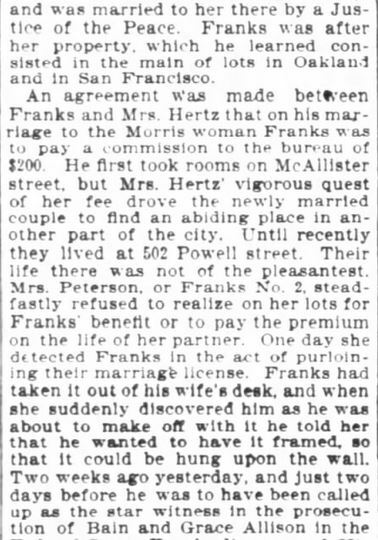 An agreement was made between Franks and Mrs. Hertz that on his marriage to the Morris woman Franks was to pay a commission to the bureau of $200. He first took rooms on McAllister street, but Mrs. Hertz’ vigorous quest of her fee drove the newly married couple to find an abiding place in another part of the city. Until recently they lived at 502 Powell street. Their life there was not of the pleasantest. Mrs. Peterson, or Franks No. 2, steadily refused to realize on her lots for Franks’ benefit or to pay the premium on the life of her partner. One day she detected Franks in the act of purloining their marriage license. Franks had taken it out of his wife’s desk, and when she suddenly discovered him as he was about to make off with it he told her that he wanted to have it framed, so that it could be hung upon the wall. Two weeks ago yesterday, and just two days before he was to have been called up as the star witness in the prosecution of Bain and Grace Allison in the Federal Court, Franks disappeared. His second wife did not know of his going. In some way he managed to remove the contents of her trunk without her knowledge, and he quietly slipped away to Mexico. 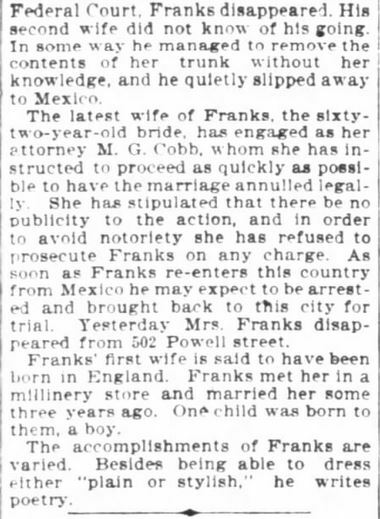 The latest wife of Franks, the sixty-two-year-old bride, has engaged as her attorney M. G. Cobb, whom she has instructed to proceed as quickly as possible to have the marriage annulled legally. She has stipulated that there be no publicity to the action, and in order to avoid notoriety she has refused to prosecute Franks on any charge. As soon as Franks re-enters this country from Mexico he may expect to be arrested and brought back to this city for trial. Yesterday Mrs. Franks disappeared from 502 Powell street. Franks’ first wife is said to have been born in England. Franks met her in a millinery store and married her some three years ago. One child was born to them, a boy. The accomplishments of Franks are varied. Besides being able to dress either “plain or stylish,” he writes poetry. Note: See, above: Franks had borrowed something like $50…then attempted to borrow a much larger sum. Today, $50 is a good chunk of change but not the end of the world. According to an inflation calculator, $50 of 1898 dollars would be worth: $1,428.57 in 2015 (calculator does not extend to 2016). Okay…Almost $1500 is a lot of money. Please scroll down, below the images of the newspaper article where the information continues. San Francisco Chronicle. 29 January, 1899. Part 2 of 10. Note: The article is a bit difficult to read in places, as the 116 year-old images either did not scan well or had faded beyond the ability to do so. With a bit of patience it is readable…and the story told within is so worth understanding. I urge you to read it all! San Francisco Chronicle. 29 January, 1899. Part 3 of 10. San Francisco Chronicle. 29 January, 1899. Part 4 of 10. San Francisco Chronicle. 29 January, 1899. Part 5 of 10. San Francisco Chronicle. 29 January, 1899. Part 6 of 10. Note: See in the above section that Franks had borrowed something like $50…then attempted to borrow a much larger sum. Today, $50 is a good chunk of change but not the end of the world. According to an inflation calculator, $50 of 1898 dollars would be worth: $1,428.57 in 2015 (calculator does not extend to 2016). Okay…Almost $1500 is a lot of money. San Francisco Chronicle. 29 January, 1899. Part 7 of 10. San Francisco Chronicle. 29 January, 1899. Part 8 of 10. San Francisco Chronicle. 29 January, 1899. Part 9 of 10. San Francisco Chronicle. 29 January, 1899. Part 10 of 10. Amazing, isn’t it? One man, using multiple matrimonial bureaus and agencies to defraud multiple women of their property, finds himself scammed in the midst of it all by a woman demanding an expensive courtship. The only bright one in their midst appears to be the Swedish Serving Girl who broke off an engagement with the man when he requested to borrow money from her. Today’s women could take a lesson from her, don’t you think? Please– scroll down and leave a reply! And please forward this article to those you know who may find it interesting. Note: Newspaper clippings were obtained from newspapers.com. Up Next! 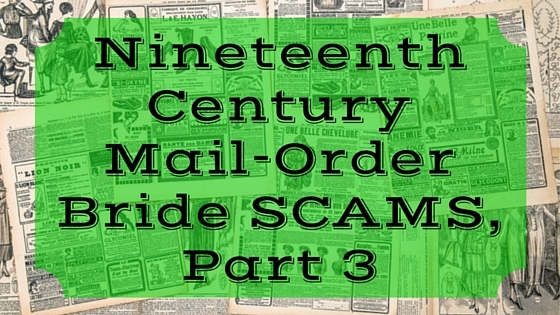 Nineteenth Century Mail-Order Bride SCAMS, Part 4. In 1865 (34 years earlier than Franks’ scheme), a similar incidence in New England didn’t get quite so far but caused quite a stir. This reminds me of one of the stories in Chris Enss’ book on real mail-order brides, HEARTS WEST. Thanks for sharing. Wasn’t that book by Chris Enss a good read? (You’ll find my review of this book on my site: http://www.kristinholt.com/archives/998) I’m continually amazed just how many scams were out there…how many people were taken in by them. Fascinating studies!